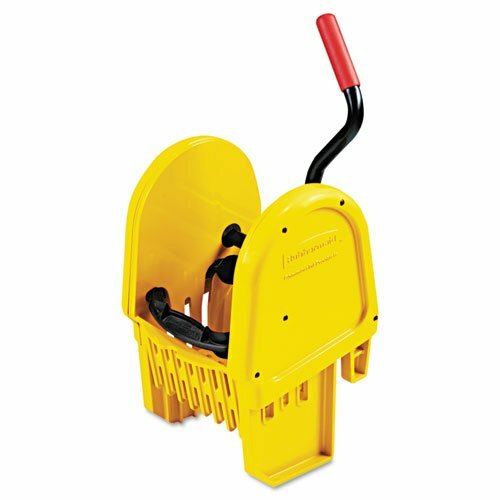 Rubbermaid Commercial WaveBrake Down-Press Wringer, Yellow Down-press wringer is manufactured specifically for use with 8.75-gallon WaveBrake buckets. Highly efficient jaw-action design presses excess water straight down into the bucket. Ergonomic handle minimizes stress on user's wrist. Rigorous testing ensures longevity, more than 100,000 cycles. Premium tubular steel and molded plastic construction. Depth: 13 1/5"; Width: 13 1/2"; Height: 27"; Material(s): Plastic/Steel. Ergonomic handle. Manufacturer's limited one-year warranty. Manufactured specifically for use with 8.75-gallon WaveBrake buckets.